Know the value of developing a strong mental game. 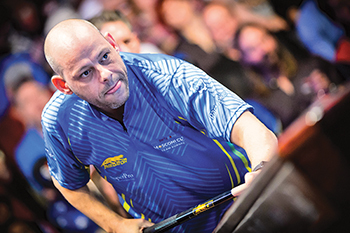 As I begin this new journey, sharing insight and tips with the pool-loving readers of Billiards Digest, let me tell you a little about myself as a player. I am, by nature, a very competitive person in everything I do. I am, of course, particularly competitive when it comes to pool. Unfortunately, during my years playing English 8-ball in the United Kingdom, I didn't always handle defeats well. In fact, I used to really beat myself up. It took me two or three weeks to get over some of my defeats. All that changed when I switched to American pool and went to the Philippines to learn everything I could about the game. I learned a ton about playing the various games, but the lesson that made the biggest impression on me didn't even involve taking a shot. The Filipino players taught me about mental toughness. Missing a shot or losing a game never affected them. They almost immediately moved ahead to the next game, the next shot. I remember thinking, "How can they stay calm after missing that ball?" It was amazing. It was then that I learned to analyze and move ahead. I went from really suffering through defeats, to getting over them in an hour. I bring this up because that change in my approach has had a huge impact on my game. I think the mental side of your game is as important, if not more, than the physical side of your game. We'll have plenty of time in the coming months to go over mechanics, practice drills and how to properly analyze the table. But in this first article, let's talk about the mental side of the game. The mental side of pool is about self-study and self-analysis. Everyone is going to miss shots. That will not change. It is how you react to misses and what you learn from them that is important. When you start out in the game you simply see the balls and hit them into pockets. It's all about having fun. The learning process starts when you begin to play competitively, in leagues, small tournaments or even just against friends at the poolroom. Pressure comes into the equation because you don't want to let yourself or your teammates down. This is where having mental strength makes a difference. It does so in two ways: One, you develop a mental approach to handling pressure situations; and, two, you develop a mental approach to handling and analyzing mistakes. We learn about pressure mostly through failure. But instead of dwelling on failure or your inability to handle the pressure, focus on self-analysis. I always try to analyze how I would improve my results. What went wrong? Was it my cue action? Were my feet wrong? Did I rush the shot? Most of the time you know straight away why you missed a shot. It can only be a technical or mental mistake. Train you mind to recognize the same situation and figure out how to better handle that situation next time. Focus on composure and remembering what your body felt like the last time you missed. Did you grip too hard? Not follow through? It is very important that you are honest with yourself in your assessment. Learn from the experience. Quit telling yourself you played great, when you really didn't. The truth may hurt, but it will help. My main goal is to never make the same mistake twice. Again, once you accept that you are not going to make every shot, you are going to be better. You can't beat yourself up over every miss. And you can't be fearful of missing shots. Accept your mistakes. When you are young, you look for perfection. You miss a shot and say, "How could I possibly miss that shot? It's impossible!" Let it go. You will never find perfection on the physical side of the game. But you can find perfection on the mental side. One of the biggest changes for me was that I started to enjoy the pressure and embraced those moments. Embrace the challenge of playing under pressure and having to make a big shot. As long as you accept that you aren't going to be successful 100 percent of the time, you will handle the pressure better. Another way to strengthen the mental side of your game is to put pressure on yourself during practice. If I'm playing the ghost, I try to imagine playing Shane Van Boening or Dennis Orcollo or Efren Reyes. I get myself in the mindset that we are playing a big tournament match. I try to put as much pressure on myself as I can. It really does help mentally when I get to a real match. You can apply that process at any level. You just need to visualize the situation. And find a technique that will hold up when you are under pressure. When I'm in a pressure situation, I shorten my stroke. Getting closer to the cue ball cuts down on the backswing. A shorter backswing means there is less chance of not cueing where you intend to cue. In those instances, look for ways to keep the game simple. It all comes back to the mental side of the game. The more you put yourself under pressure - even in practice - the more prepared you will be for actual match pressure.